This trip is organised by request for newly wed couples. A woman from the Hammam, Mina, will accompany the new bride to a Moroccan bath house. The women will then hold a party in the heart of the Kasbah for the newly wed couple. You will discover the music of the Berber people of the Drâa Valley. 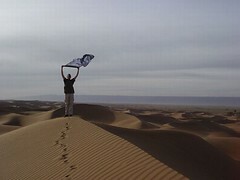 Chigaga is the biggest sand dune to the south of Zagora and is a very romantic location. You will spend the night at the foot of the dunes beneath a Berber tent, decorated with carpets. Around the fire and accompanied by nomad musicians, you will enjoy a typical Moroccan meal. By the route of the caravans, we’ll return to Zagora and spend the night in the hotel.